It is amazing to me that no two chess games are ever alike. Considering that there are a limited number of pieces on the board, each with their own restrictive movements, it is quite fascinating that there are nearly unlimited variations to this thinking person's game. An accomplished player will need to consider a whole host of possible movements while speculating about future counter-moves. Chess is then similar to math linking probability to an underlying and intentional master plan behind each and every move. 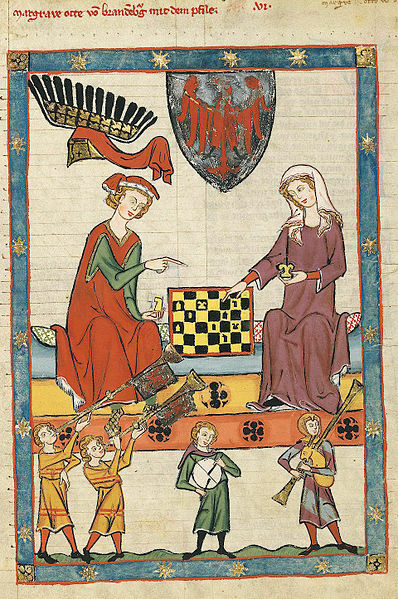 The game of chess has, in fact, been used as different types of metaphors. The most common is related to strategies of war. The enemy is the opponent, and one considers each move in the light of possible reactions and retaliations. The same approach can be used for business ventures or even plans and planned changes in the workplace or in one's life. One acts on and analyzes the different possible reactions that may occur as a result of a given action. Decision-making is not a simple process. A conscientious person will make prognostics about the decision before she acts, not after. It is a mental picturing of how things may turn out; one considers the evidence and other peculiars of the situation to come up with the best possible action. We encounter this particularly in heist movies where the plan is laid out, how things are supposed to develop, and then the actual heist falling apart at the seams because of an unforeseen detail, a minor, perhaps unexpected oversight, or an unaccounted random chance or “freak” occurrence. Those may be the extreme ends of decision-making. But in our ordinary lives we do encounter choices on a daily basis. Everything from the trivial to the significant. Sometimes the trivial may turn out to be life-changing. For example, a few years ago we decided not to go to a Mexican Independence festival that ended up falling victim to a grenade attack with a number of casualties. The decision breaker here was the fact that my wife was pregnant at the time, and we knew for a fact that the event would attract large crowds. Had my wife not been pregnant, we probably would not have missed out on this event. We hear such stories of people making minor, seemingly banal decisions that may have saved their lives. We may put more weight on the selection of significant decision points, such as where to live and work, having children, buying property, but even the trivial category of decisions may have the potential to alter our lives in significant ways. So if even your minor decisions may have such an impact, does that not make you feel anxious and paranoid? I mean we are bombarded with the possibility of many choices the same way a chess-player has a number of moves at hand at pretty much any moment (unless he is being checked or close to check-mate; in that case, his options would be severely limited). Add to this the selection of words at any given moment. Do we tell a colleague what John Doe did at the Christmas party with Jill? The impulsive will not be able to control themselves or their tongue, while the speculative chess-players might carefully weigh choices and repercussions before speaking. Can a right word or right action at the right time land you the job or promotion or even the mate you have always dreamed of? Or would the opposite happen, you botched a wonderful opportunity because of something so seemingly insignificant like the color of your tie or an innocuous comment that was taken the wrong way? Think about it. What you have for breakfast or maybe what you had for dinner last night may affect your day in unsuspected ways too. To drink the extra cup of Joe or not may then become a neurotically charged existential question. What are we to do? Are we to have an in-house psychic or a pocket-sized I Ching or Tarot cards oracle to run past and consult every moment of our lives? What to wear today, what music to listen to on the iPod, what topics to address at work? Many of us will say that those things are trivial and one needs to be spontaneous about them. Or one may need to listen to one's gut feelings since it is impossible to plan everything out. And that is my point here. If you add up and fret about all the alternative possible moves you may have made during your life time, it will drive you insane. If I had not moved to that particular deserted oil-town in Mexico by listening to the advice of parents, colleagues and financial advisers, I would have never met my wife there and not have had my beautiful son. Did I seriously consider that outcome? Was it a logical, well thought out decision? All this is similar to the situation of Tomas in the opening passage of Kundera's novel The Unbearable Lightness of Being when he comes to the conclusion that “Es muss sein" (It has to be) and that there is no way of living an experimental parallel life with a combination of different decisions. There is nothing to compare against except the life we are given, with the choices, good or bad, we have made along the way. In a way, we need to accept our fate, the way the cookie crumbles and the way the dice roll and in the meantime simply play and carry on with our daily lives.